Today marks the ten-year anniversary of the most infamous day in the history of Duluth East hockey. It wasn’t a loss in a game, nor an embarrassing off-ice incident. In truth, the stunning news of April 24, 2003 didn’t affect the team’s performance in any measurable way. But the decision handed down that day attracted statewide attention and dominated Duluth’s news for the next year. The Duluth East administration chose not to renew the contract of head coach Mike Randolph, effectively firing the state’s most decorated coach. At the time, Randolph was a hockey icon. 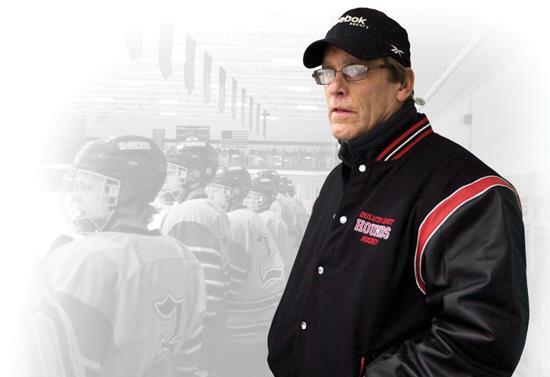 In his fifteen years at the helm of the Hounds, he turned a perennial underachiever into one of Minnesota’s premier hockey programs, guiding them to eight State Tournaments and two championships. East hockey had become a breeding ground for Division One hockey players, abandoning its conference to play the most difficult schedule possible and attracting talent from across the state. Randolph had a reputation as an intense, fiery leader; a brilliant hockey mind who demanded excellence at every turn. His will to win was unquestioned. But as is so often the case, the very traits that made Randolph great were also his downfall. He pushed his players so hard and was so unrelenting in his demands that some lost their passion for the game. He had to cut many players over the years, and he never was one to mince words in doing so. In his efforts to balance the development of his stars and playing time for all, he’d inevitably made a number of enemies. Fixated on his team, he delegated team fundraisers to his assistants, and some accounting issues sprang up. Randolph, his critics argued, had lost sight of what high school sports were supposed to be. Down came the axe, with no explanation given: data privacy laws allowed the administration to dismiss him without cause. If Randolph’s tale were a Greek tragedy, the story would have ended there, with the hero felled by his tragic flaw. But Randolph, a fighter to the end, demanded answers. His legions of supporters mobilized against the alleged injustice, and the coach waived his right to privacy and threw open his confidential personnel file for the world to see. His supporters had responses ready for each and every charge, and claimed conflicts of interest at every turn; many of the complainants were parents of cut players with axes to grind—including the East principal—and a leading Randolph critic on the school board had prominent ties to East’s private school rival, Duluth Marshall. No one seemed to have an objective account of what really went on in the East hockey program, and no one’s testimony seemed entirely trustworthy. All of the intrigue culminated in several explosive exchanges with the school board, which ultimately voted to uphold the administration’s decision. For one year, anyway. That fall, the fate of a hockey coach became an election issue. Three school board members who had opposed Randolph’s reinstatement either lost their bids for re-election or retired. In April 2004, shortly after East’s 3rd place finish in that year’s Tournament, the board declared it had erred the previous year. Randolph had his job back. Naturally, people with little interest in hockey found the whole affair absurd. Duluth public schools faced declining enrollment and tough budgetary decisions at the time, and yet the only thing that inspired any passion was a man in charge of an extracurricular activity who made $4,000 a year. And even if Randolph had been wronged, why drag out a fight that would only serve as a distraction? To some, it was a matter of justice, pure and simple. To those who took a longer view, it raised crucial questions about the meaning of high school sports, and even a high school education in general. The debate over whether the program was “too big” probably deserves its own post, but there are plenty of other things to consider. There’s no doubt Randolph was (and is) a tough coach, and that he is not for everyone. But he wouldn’t be controversial if it didn’t work. Is high school too soon to place a hockey team under the command of someone so demanding? Are the claims of burnout enough to invalidate the testimony of those who cite Randolph as one of the most important formative figures in their young lives? Even if the administration had just cause to can Randolph, were there issues with their methods? Should the wronged party (whichever one it might have been) ever stop fighting an injustice for the good of the team, or the community? Where are the lines between demands for perfection and emotional abuse, between intensity and depravity? Would we rather have coaches who push us to the limit, or ones who take things as they come? When framed in those terms, the questions become near-existential, and it’s not so hard to see why the Randolph saga enjoyed so much attention in Duluth. In the beginning it was only about hockey, but by the end came to mean so much more. So, what verdict might we pass on Randolph’s return to Duluth East? Naturally, it’s in the eye of the beholder. I’ve been through nearly every press clipping, talked to many people around the program, watched every old State Tournament game on DVD, and done my share of eavesdropping at the rink, and I’m not still not sure I have an easy answer. East has been to six State Tournaments in his nine years back on the job, though the third state title has eluded him, and there have been a few playoff disappointments along the way. Moreover, the scrutiny brought on by the 2003-04 saga has left him under the microscope ever since, with controversies at every turn: an accusation of physical abuse (unsubstantiated), players leaving high school for junior hockey (some citing the coach as a reason), Randolph’s criticisms of those who leave, alleged favoritism when his own son was on the team (untrue, in my opinion), claims of recruiting, and scheduling controversies, along with the typical disputes over playing time and cuts that plague most any high-profile program. On more than one occasion, I’ve wished he might find some way to ride off into the sunset so that we could leave all of this behind and move on to the next coach. But that, of course, wouldn’t be Randolph’s style, and for the time being East hockey is wedded to him, both in victory and in defeat. And even if I grumble from the stands from time to time, I can’t quite picture East hockey without Mike Randolph stalking the bench behind his players, arms folded, glower in place as he barks at his Hounds, orders them to begin that patient cycle that so enthralled me as I watched from the stands in his first season back on the job. I was a freshman back then, and without his quarter century of work, I doubt I’d care about this sport half as much as I do.